Successfully Added Executive Edition 1080P Full HD Ink Pen Camera (8GB) to your Shopping Cart. Executive Edition 1080P Full HD Ink Pen Camera (8GB): A refined writing instrument with a high definition camcorder and digital still camera hidden inside! This pocket gadget is beautifully presented and framed with a classy, gloss black exterior. Designed to look and work as a fully-functioning business ink pen, it is actually a high quality camera for recording smooth motion video at 1920 x 1080 and to capture still photographs at 4032 x 3024. It also records audio separately or with video, and comes with 8GB of internal memory for tons of confidential data. With its deceptively normal exterior and top performing hidden camera, this is the perfect blend of modern technology and high class stationery for all aspiring secret agents. Easy to use and practical, this is an elegant and compact pen designed with portability in mind so it fits unobtrusively anywhere. This HD Pen is ideal for those working within business, education, HR, security, media, press relations, tourism and many other areas. This is a truly flexible and desirable item that can be used by anybody, anywhere! Place it on your desk, on a shelf, or in your shirt pocket - it is the perfect covert device to trap unsuspecting people in embarrassing situations. 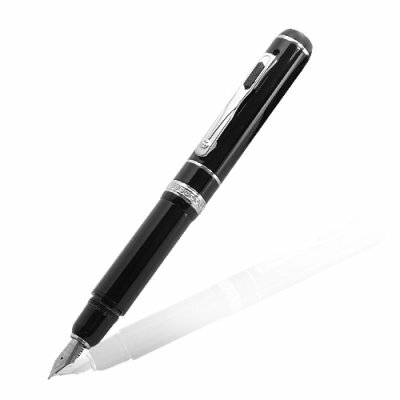 Realize high class undercover missions with the superb Executive Edition 1080P Full HD Ink Pen Camera. Available right now at a direct-factory price, for single and bulk order purchases, it is brought to you by the online leader in gadgets and electronics, Chinavasion. Very elegant design device, which also writes great.